Vans Space Voyager Collection commemorates NASA's 60 years of space exploration and discovery. Since the 1960s, Vans has marketed its skate shoes as being "Off the Wall." But with the launch of its latest capsule, the sneakers might be more aptly tagged as "off the planet." 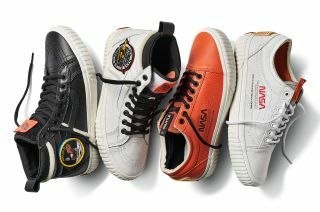 Vans Space Voyager Collection, celebrating NASA’s 60th anniversary, includes sizes from toddler to adult. Vans Space Voyager Collection, celebrating NASA’s 60 years, features apparel and accessories in addition to footwear. See more items from the Vans Space Voyager Collection at collectSPACE.